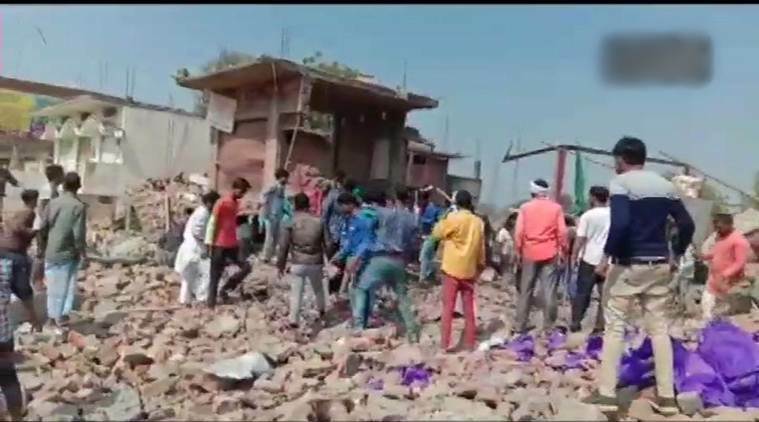 Bhadohi: Ten people were killed and six injured in an explosion at a shop here on Saturday afternoon which also led to collapse of three adjacent houses, officials said. It is suspected that some people are still trapped under the debris and a rescue operation has been launched, they said. The blast took place at the shop in Rohta Bazaar. Kaliyar Mansoori, who used to run the shop, is among the 10 deceased. His son was running a carpet factory behind the shop and its workers could be among those trapped under the debris, District Magistrate Rajendra Prasad said. Locals claimed that Mansoori was also in the business of making illegal firecrackers. Besides Kaliyar Mansoor, three deceased have been identified as Irfan Mansoori, Abid Mansoori and Chandu, while efforts were on to identify the other six. The injured have been admitted to hospital, the district magistrate said. Earthmoving equipment has been pressed into service to carry out relief and rescue works. Teams of forensic experts, NDRF and senior district officials have reached the site, he said.